The Russian holding which produces electronic components for military and civilian satellites is exploring the possibility of setting up joint ventures in India. The Roselektronika holding plans to cooperate with India in the field of manufacturing of defence products in this country, its CEO Andrei Zverev told reporters on Wednesday. “We are negotiating with our Indian colleagues about the possible involvement of our holding in different kinds of programs to create modern defence products in India,” Zverev said. Zverev said that the holding plans to create joint ventures in India. “This is now the Indian side’s requirement – not the supply of finished high-tech products, but in particular, the establishment of joint ventures, and as part of those- transfer of the know-how and manufacturing of different samples,” he said. “The final decision is always made by the Federal Service for Military and Technical Cooperation, but we do not see any obstacles with India,” Zverev added. By 2018, Roselektronika also plans to produce up to 90 percent of electronic components for the military and civilian satellites in Russia, and if sanctions against Russia are imposed, the implementation of the program of import substitution can be accelerated. “If global sanctions are imposed, we will have to spend heavily, but we will cope with this problem. If the sanctions are not imposed, the import substitution program will be implemented in the next two to three years, and at the turn of 2017-2018 we will be ready to produce up to 90 percent of the payload for our satellites, of both civilian and military purposes on our facilities,” Zverev said. 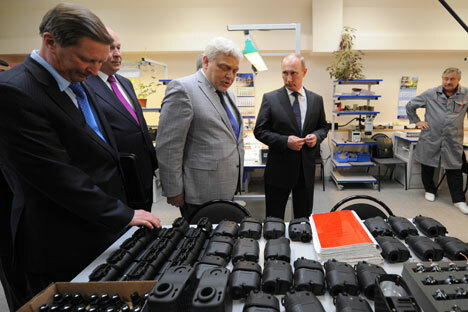 According to him, Russia has all the technological possibilities for the production of microelectronics for the space industry; the only question is the cost of the final product. Zverev added that a rapid unification of the samples for microelectronics for Russian spacecrafts in the future will allow the serial production and the profitability to be increased, while reducing the price per item. “Now we have come to a point where up to 20,000 different part types are used in the spacecraft, while the European Space Agency has a total of 1000 of all part types of electronic component base permitted on board,” Zverev said. He added that this task would be handled along with the Russian Space Agency and the Joint Rocket-Space Corporation ( JRSC ACCD ). “I hope that in the near future we can reduce the number of part types to at least 1,500-2, 000,”Zverev said.